Can anyone tell me what the in line engine in picture 2 & 3 in batch two is? I remember seeing it at another show and thought that it was interesting but could not remember what it was called. That is a Snow Engine designed by Doug Kelley. Some good engine sther Tim, thanks for posting. Thanks for posting all the great pictures from the show; appears there was a good turnout this year. The engine in photo's 2 & 3 in batch 2 is called the Snow. 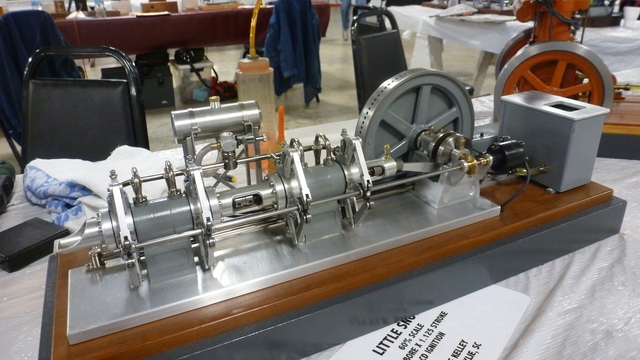 It is a tandem cylinder double acting gas engine similar to the very large stationary Snow gas compressor engines built in Buffalo, NY in early 1900's. The original model design was done by Doug Kelley and a build series of his Snow model engine was featured in the the Home Shop Machinist magazine. This particular model is Doug's second Snow model engine and was built to a 60% scale of the original Snow model (.625" bore). Thanks for posting the photos. Looks like a great collection of engines as always at Zanesville. Great pictures. A show I hope to get too, perhaps as early as next year. Thanks Tim for sharing them. It is great to see pictures from the Zanesville show, when I couldn't make it. Thanks for slipping in your own very worthy engines. Thank You Tim for posting all these nice pictures. What is that engine doing and do You know more about it?? 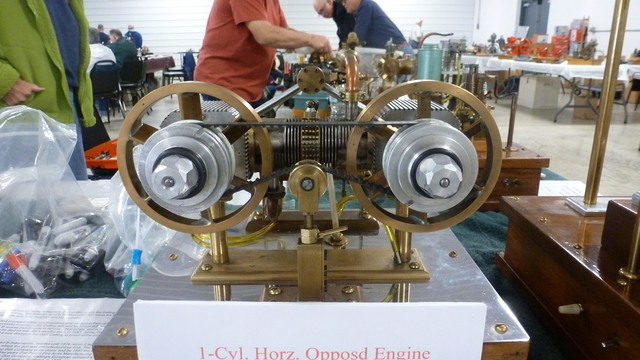 Neils, the brass engine is an opposed piston engine (2 pistons opposed in the same cylinder) built by Dale Detrich. He has a webpage http://www.daledetrich.com showing some of his engines, but I don't see that particular one featured there. You could email him. He's a very nice guy. As for the "Snow" engine, it has a few big brothers here in the US. I have seen a large one running myself. Very large. Thanks for the information on the Snow engine. I will have to do some investigation.